Professionally furnished conference room with one conference room table, which comfortably seats six and could accommodate eight. There is also a 48″ monitor for digital presentations. 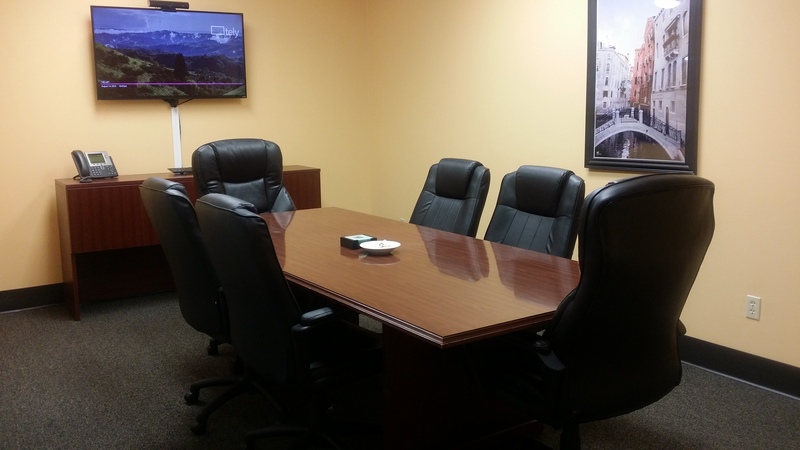 The conference room also includes accessories to compliment a professional environment. The board room includes table and chairs. Guest seating will accommodate four guests total. It also includes office accessories to compliment a professional environment. Inviting fully furnished and staffed lobby for guests with bottled water for hot and cold beverages. Business center services with color copier/scanner/fax machine and use of our fax number, and convenient postage services. Access to major shippers and office supplies may be delivered directly to your office. Professionally furnished private shared-meeting spaces available for business meetings. Wi-Fi access, upon request for client meetings. Access to event planners and catering. We want to pamper business guests. Private break room fully furnished with sink, microwave, toaster oven, and refrigerator, conveniently providing fresh brewed coffee. Business lounge for our clients to have a “place to get away” without leaving the office. Professional virtual staff providing exemplary service in a transparent fashion, resulting with “raving fans” rather than just satisfied customers, looking out for client’s best interest and success in whatever the project. “One-stop billing” for all your private office management needs. Private fine-dining club on the 21st floor, see if your membership is a reciprocal club, of the Republic Centre. We look forward to your call during office hours Monday through Friday 8:30 a.m. until 5:00 p.m. EST. Check out the blog for helpful business tips and fun experiences in Chattanooga, TN. Call (423) 266-6388 or fill out the form below to schedule a tour of our offices and learn more.